This 2000 sq feet apartment is spread over two levels. The aim was to give the apartment a very simple, stylized, elite feel while adding a sense of continuity. The lower level consists of a guest room, living and dining space, and a large 1000 sq ft terrace. The upper level has the family bedrooms and private spaces. Each space and element has been carefully detailed to have an exquisite essence of its own, with the straight line forms of the furniture forming the unifying vocabulary. We chose a simple white palette, using wood to add warmth and timeless style. The use of large glass windows and metallic accents add elegance and sophistication to the space. We designed the home to have a seamless flow of one space into the other, so that the space appears even larger than it is. To allow flexibility in using these spaces, we built in conveniences like sliding doors, roman blinds, and other features. As one walks in, the passage looks on to the guest bedroom through a frameless, fixed, clear glass provided with a roman blind for privacy. The living and dining area give access to the terrace, and have a solid wood floor. This is complemented by the 8-foot long glass sliding door framed in teak wood, creating a picture frame feel for the views of the landscaped terrace. The colour scheme is echoed in the walnut wood sofa with pure white leather cushions, but possibly the most striking feature of the living room is the statement wall behind the television. 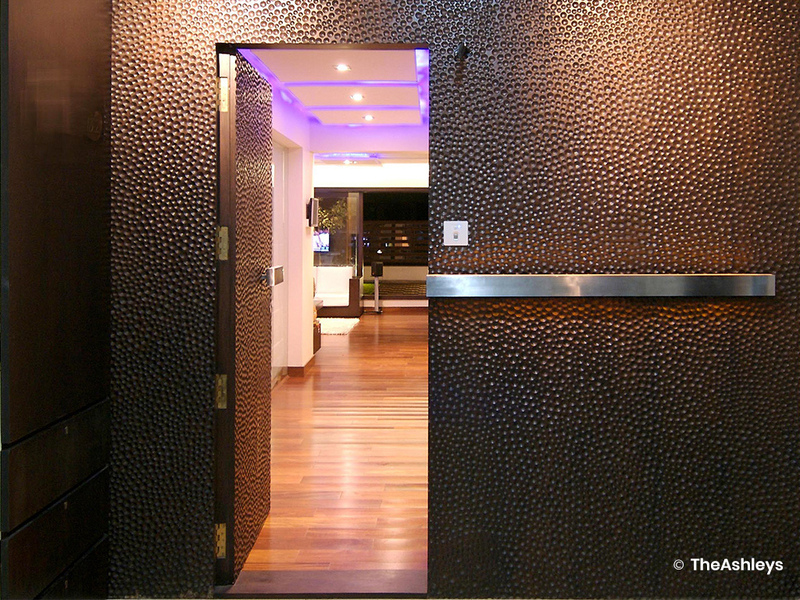 This rectangular floating wall has been clad with 20,000 sliced wine bottle corks, adding interest and dimension to the room. To the left of the living room is a stunning dining table and wooden staircase leading upstairs. The bold proportions and novel sense of detailing of the dining table make a statement of their own. With wood engraving, oxidized brass in hand-cut circles, and straight-backed chairs, the dining table is perfectly set off by the off-white sheers and roman blinds behind. The terrace has been optimized to create a large space in which residents of the apartment may enjoy some quiet time, or host events with a great view. The periphery has been defined by a wood and glass slat railing. 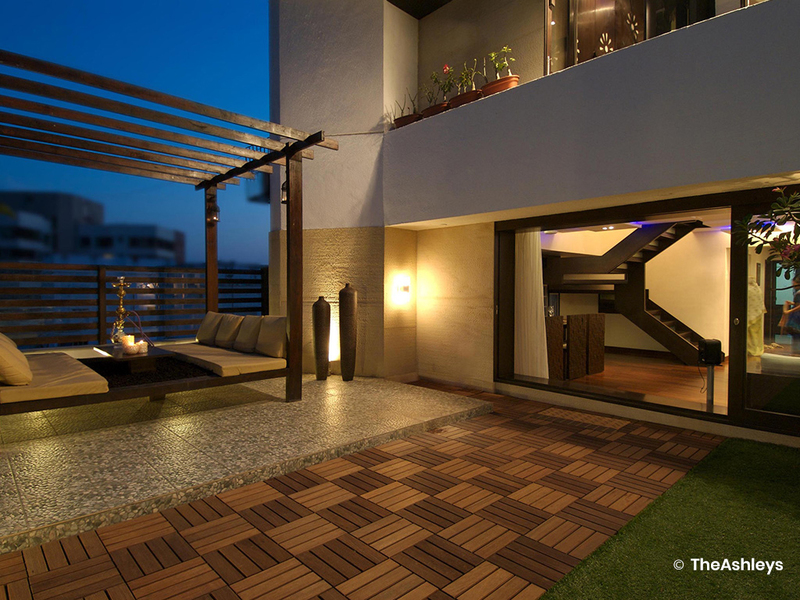 A section of the terrace flooring is made of wood, transitioning to a lawn on one side and a pebble-tiled deck on the other. A gurgling water cascade, mellow lighting, and a large pergola with wooden seating creates the perfect setting to unwind. The bedrooms are havens of peace and uncluttered minimalism. The camouflaged portals lend a seamless look to the space. We played with textures to keep the bedrooms warm and intimate – wooden furniture, mother of pearl engravings on the walnut cupboards, mirrored walls – all these elements come together to add space. The son’s bedroom shows unusual combination of rich, dull gold polished circles engraved into a minimal structured headboard of the bed. The wardrobe shutters have been designed to look like they have been crisscrossed by fine threads dense at the bottom and sparse as they move upwards. The walnut polish and gold minimal lines of the bed and the wardrobe bring a perfect synergy between the two differently detailed pieces of furniture. All the bathrooms have distinct dry and wet areas with shower cubicles. The dry area in the bathrooms has been tiled only till the dado rail, while the rest of the wall has been wall-papered. The washbasin in the master toilet has been carved out of a solid block of wood which forms the counter. The Jacuzzi set in a wooden platform and the wooden shower panel brings a romantic spa feel. The entire house has both yellow light for mood lighting and recessed day light for general lighting. 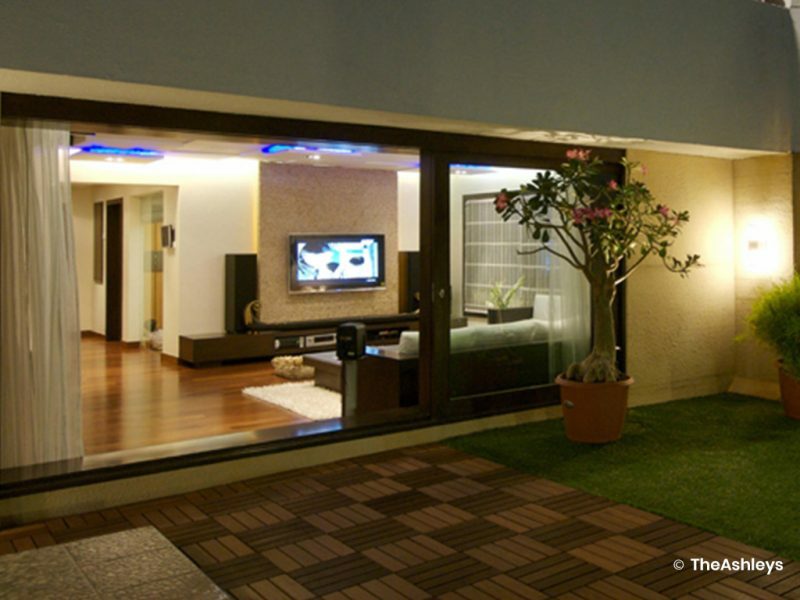 In the living room there is a recessed colour changing led strip to create an ambience lighting. The floating flat screen wall is backlit. 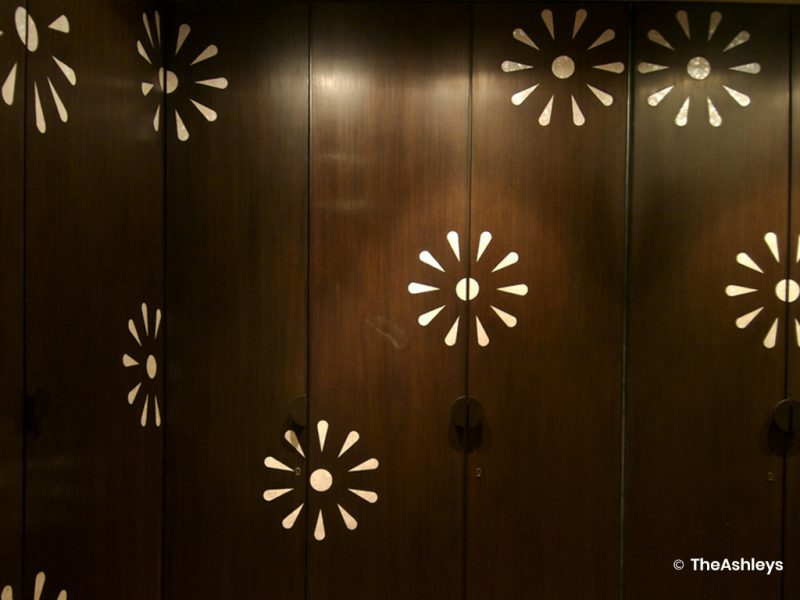 Halogens on the false ceiling have been used as accent lights to highlight the art, artefacts and details. A triple tiered light like glass orange peels lights up the stairway. The lighting and the curtains in the living room and the master bed are automated and centralized from a console in the living room. The roman blinds are of raw silk, the living room sofas are of white pure leather. The den sofas are a combination of beige chequered leather on the arms and plain leather on the seating. The sheers of the living room have been imported from Dubai. The bed covers are all in a neutral palette. The entire house is painted off white which is a perfect canvas for the wooden floor and furniture and lends the space a very tranquil mood. The accessories have been carefully hand-picked for each area.